It’s been an exciting week for drug safety with articles in both USA Today and FiercePharma examining the five-fold rise in reporting of serious adverse events into FDA’s Adverse Event Reporting System over the past twelve years. We were thrilled to see Advera Health featured prominently in both of those articles. Despite the significant reporting increase, limitations in the use of FAERS data for post-market surveillance remain. One of the biggest limitations is that not all adverse events are reported. As a spontaneous (i.e., voluntary) reporting system, it’s simply not possible for every adverse event to be recorded. This is different from a controlled clinical trial where all adverse events and outcomes are recorded. Nonetheless, FDA and industry rely on FAERS as an early warning system for emerging safety issues in the real world. And as the size of the FAERS database grows, and the analytic tools to parse and interpret these data mature, the reliance on FAERS will only continue to grow as well. How do we reconcile the growing reliance on FAERS with the very real limitation caused by the lack of complete reporting? For us, the answer was to figure out a validated method to estimate the reporting rate of adverse events in modern FAERS. Because if we could do that, we could then estimate the total number of adverse events occurring in the real world. Simple, right? Yeah not so much. There is no existing solid methodology for estimating the reporting rate in FAERS. When forced, most drug safety professionals will cite a single line in a GAO report from 2000 that estimates that between 1 and 10% of adverse events are reported into FAERS. That estimate is now 17 years old. It is unclear how it was determined and tested. It fails to account for the exceptional growth in FAERS reporting detailed in the articles above, in the improved technology advances to ease the reporting process, or in the evolving requirements for reporting by pharmaceutical companies. Most importantly, it doesn’t factor in the advances in data science and analysis that have taken place over the last two decades. To us, it has always seemed that the estimated FAERS reporting range of 1% - 10% is at the very least outdated - and that it quite possibly is just wrong. Last year we launched our clinical evidence module within the Evidex platform. The Advera Clinical Evidence module (ACE, for short) aggregates adverse event and outcomes data for nearly 5,000 clinical trials. 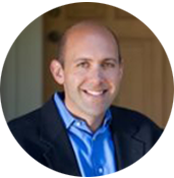 ACE gives us an unparalleled look into the reporting rate of adverse events in clinical trials. And by comparing that rate of reporting in clinical trials we can draw a drug-by-drug, AE-by-AE comparison to FAERS reporting. Next week at the Academy of Managed Care Pharmacy (AMCP) Conference, we are presenting an abstract and poster detailing our basic methodology for estimating the reporting rate in FAERS and some initial findings. For this study, we looked at fifty drugs across four major indications. For each, we matched the rates of serious adverse events recorded in clinical trials to the reporting rates of those same serious adverse events in FAERS. What we found was stunning. 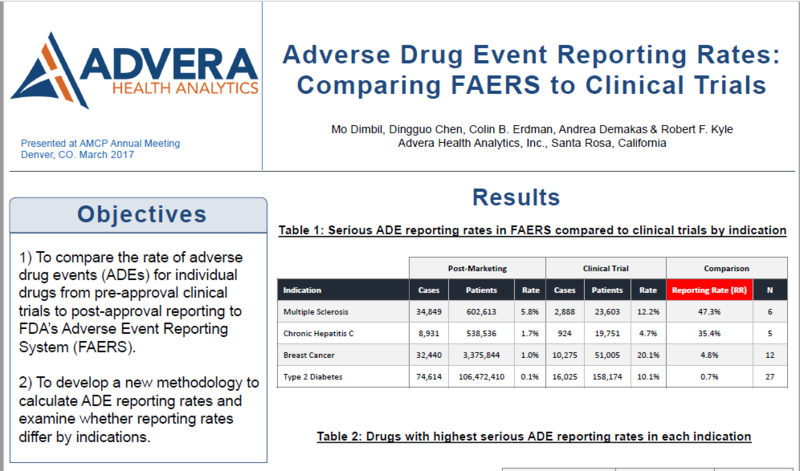 Not only is the rate of adverse event reporting in FAERS vastly different from the old 1% - 10% estimate range, but it varies widely by indication and class. As we move forward, we will expand this study to include more drugs, indications and classes. We hope to validate and publish our full methodology and findings before the end of 2017. If you’d like to see what we’ve done so far you can download a copy of our poster by clicking here. Follow this link to learn more about Advera's Clinical Evidence database. And if you happen to be at AMCP in Denver next week, please come see us at Booth 237 to discuss these results and the other unique services we’re providing in the payer, provider, and pharma markets.